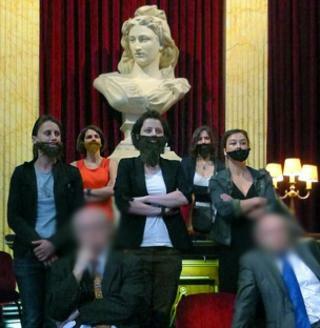 A group of French feminists has found a new way to fight inequality - with sarcastic humour and fake beards. Only rarely is there a violent response. Colette Coffin unzipped her handbag and pulled out a small piece of artificial fur. "This is my speaking beard," she explains. "I've got a much bushier one but this has a wider hole so I can talk without getting too much fluff in my mouth." Deftly, she hooks the string loops around her ears and turns to face me. The effect is bizarre. With the little ginger triangle on her chin, the schoolteacher wearing a prim summer dress resembles a wannabe Lenin. Ilana Eloit, a political sciences student in jeans, shows me her beard. It matches her long dark hair perfectly but she complains it is "very itchy". Glancing around, she stuffs it back into her bag under the table. "We don't want to give the game away yet," she says. As dusk falls, I sit at a pavement cafe in an upmarket neighbourhood in Paris with a dozen members of the direct action feminist group, La Barbe. The name comes from the group's pantomime style of protest. Its members infiltrate high-level, male-dominated meetings. In due course they get to their feet and silently don false beards before one of them reads out an ironic statement congratulating the men on their supremacy. The emphasis on facial hair ridicules antiquated male attitudes. "It's meant to be 'ringard'," says Ilana. Oh la barbe! - What a drag! "How would you translate that? Maybe 'corny' or 'behind the times'? You see, in the days of the Third Republic, all the great men used to wear big beards. That was the end of the 19th Century but not much has changed in the way many men behave and think in France." In colloquial French, La Barbe also means "enough is enough". The group includes women of all ages from teenagers to grandmothers. They come from a variety of backgrounds and say they are united by a determination to fight entrenched sexism. La Barbe was set up four years ago in the wake of the last presidential elections when, for the first time, one of the mainstream parties fielded a female candidate for the top job in French politics. Ultimately the Socialist candidate Segolene Royal lost out to Nicolas Sarkozy of the centre-right. Now Royal's ex-partner, Francois Hollande, the man she lived with for 25 years, is president. Back in 2007, many women complained about male chauvinism in the press and on the campaign trail. When Royal announced her decision to stand, some of the most dismissive remarks were made by her own party colleagues. Laurent Fabius, who ran against her, publicly asked who would look after her children if she went for the presidency. Since then La Barbe has targeted political parties, shareholder meetings of big businesses and other institutions which they see as male-dominated. Image caption No films by women? "Marvellous! ", "Thank you!" Recently the group made global headlines when members crashed the Cannes Film Festival. On the red carpet normally reserved for glamorous stars in designer dresses, five bearded women posed with signs which read "Marvellous!" ''Thank you!" ''Splendid!" and ''Incredible!" They were angry that none of the 22 films selected for the official competition was directed by a woman. "Generally, feminist happenings are all about women," says Colette. "But we focus on men because the problem for us is not women, it's men. "Our idea is to create a mirror effect to show a male-dominated situation which highlights the invisibility of women." On this particular evening, the group had invited me to witness a protest at the headquarters of the French Freemasons, the Grand Orient de France, which was founded in 1733. I wondered why they had picked on the masons. For many years, the Grand Orient would not allow its lodges to initiate women, but this changed in 2010. "You see, there was a huge conflict," says Colette. "It wasn't easy at all. That proposition was adopted at something like 51% of the lodge, but it was tough and many of them are still fiercely opposed to women." At intervals, members of La Barbe walk into the masons temple on the Rue Cadet, ostensibly to hear a public lecture entitled "What sort of secular morality for what kind of Republic?" I follow them into a hall decorated with neo-classical columns and red velvet curtains. In front of a huge bust of Marianne - a symbol of the French Republic - four men are seated on a low stage. The presentation was characterised by impossibly long Gallic sentences and a succession of rhetorical questions. I try hard to concentrate but my mind starts to wander. After 15 minutes, the first bearded lady gets to her feet. Several more follow suit but the speaker, the director of a religious affairs institute, pretends not to notice. Members of the audience began to whisper and crane their necks. Finally the women climb on to the stage. Colette stands at the lectern and reads out a brief statement praising the masons for their tireless work in excluding women for so many years. With the usual irony she asks how some heretical lodges could be permitted to accept "sisters" after a battle lasting three centuries. Guy Arcizet, the Grand Master of the Lodge, looks uncomfortable but tries to smile and insists that he is all in favour of freedom of expression. "For three centuries, just like the Catholic Church, the Grand Orient kept women to one side. What heresy is it that has allowed women to join since 2010? At first outraged, La Barbe is pleased to learn that the council of the order has appealed against this iniquitous decision!... The women's apron is but for domestic work. To men the task of working for the glory of the Great Architect of the universe!" Out of the corner of my eye, I see a door opening at the other end of the hall and a security man appears. It is clear he is not amused and his face begins to twitch. Having made their point, the women are preparing a dignified departure but then a student supporter begins taking pictures. Suddenly the gloves came off. The young man's camera is ripped from his hands and the women are jostled and pushed out of the hall by about 10 men. Some belong to the security service of the Grand Orient. Others are apparently members of the masonic lodge. When I asked why so much force is being used, a plainclothes security man seizes me by the shoulder and tries to drag me down the corridor. Then he snatches my mobile phone. Colette emerges from the fracas with broken glasses and a large purple bruise on her shoulder. Other members of the group show me cuts and scratches on their hands and arms. They too had their phones and handbags confiscated. "They had no right to invade our privacy," says one of the masons. Another man, sweating profusely, is trying to calm the situation but his impassioned pleas only make things worse. By the time I get downstairs, there are four police cars in the street outside. "Over the past four years we have done nearly 100 actions but this is the first time we've had to press charges for assault," says a badly shaken Colette. I asked the French Freemasons for a comment on the incident, but they were unable to provide one. La Barbe pride themselves on their sense of humour but there is real anger behind their antics. The gender wars in France have been exacerbated recently by the Dominique Strauss Kahn scandal which exposed a time-honoured practice in France of hushing-up or shrugging off sexual advances by powerful men. Then, in the dying days of the Sarkozy presidency, a decision by the constitutional council to scrap France's sexual harassment law sparked outrage. This judgment meant that all ongoing cases not yet ruled on in court would be thrown out leaving many victims with no legal protection. The law was repealed after a complaint that it was "too vague" by a former deputy mayor in the southern Rhone region, who had been sentenced to three months in prison and a 5,000 euro (£4,020) fine for sexually harassing three employees. "On the plus side," says Ilana, "Hollande's new government has a record number of women, even if they control few of the most important ministries. But we suspect it is tokenism, because most of the top civil servants behind the scenes are men." Najat Vallaud-Belkacem, the first French women's rights minister since the 1980s, has promised a revised sexual harassment law will be presented to the new parliament within the next few weeks. She admits that France has slipped down all international rankings on equal rights, and has vowed to promote gender equality.